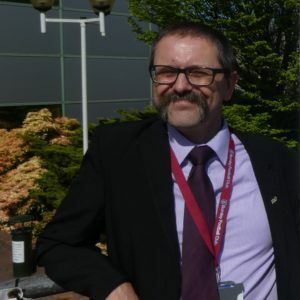 During Noise Action Week, Fife Council lead environmental health officer Don Taylor, tells John Bynorth, Policy and Communications Officer at Environmental Protection Scotland, how the council promotes its noise service across a diverse community. The diverse nature of the communities of the Kingdom of Fife breeds a variety of noise problems. Fife Council’s environmental health (public protection) Lead Officer, Don Taylor, and his team are inundated with complaints ranging from barking dogs to noisy nightclubs, bars, takeaway shops and from holiday lets. With a population of around 370,000, Fife covers a vast area ranging from the golfing destination of St Andrews, to pretty fishing villages, rolling countryside, former coal-mining communities and residential, shopping and industrial centres such as Glenrothes and Dunfermline. Mr Taylor’s support for Burnley Football Club gives away his northern English roots, and he worked for local authorities on both sides of the English-Scottish border before arriving at Fife’s HQ in Glenrothes. Fife had a total of 4,200 requests for assistance from the team in 2017. Mr Taylor said the perennial problem of barking dogs is easily their biggest source of complaint with 259 reports of dog barking last year alone. In addition 219 other domestic noise complaints were received, such as music, people shouting in their homes or the street, or about over-enthusiastic noise from DIY taking place in households. The rights of people to complain about noise and when and how to do so is easily explained in the noise complaints section of the councils’ website Fifedirect.org.uk. Residents can submit a report in a few seconds using an e-form which is then looked at by the duty officer. Fife’s environmental officers are also embracing Twitter and are currently drawing up a series of messages and links to encourage people to report noise problems – while also reminding people of certain cases where action is difficult, such as farmers who use machines to set off loud bangs to scare birds away from damaging crops. Over the last year there were also 55 noise complaints about liquor licensed premises. It can be a busy shift for the Licensing Standards Officers (LSOs), especially at weekends former miners welfare clubs and other social institutions, scattered around the local authority area, lead to many noise complaints. Lead Officer Douglas Hardaker said Fife Council’s on-call team of Licensing Standards Officers (LSOs), work in pairs out of hours. Some of their work includes responding to complaints about noise from licensed premises. Officers can be busy with this type of complaint, particularly at the weekend. Complainants can contact the LSOs direct in their vehicle on a mobile number, which allows officers to drive straight to their house to witness a complaint. LSOs have a procedure which gives the licence holder a chance to rectify the situation. When this approach fails, LSOs apply for a review of the premises licence. Around four cases a year go to the licensing board from 60 noise complaints annually about noise from licensed premises. Mr Taylor’s team has also seen a sharp rise in the number of times they have been consulted about planning applications, from just under 500 in 2016/17 to 792 in the last financial year. That figure does not include the 54 occasions in which their advice was sought by consultants and developers seeking information about acoustics last year. Mr Taylor and his team are delighted to be supporting Noise Action Week, saying it will make the public more aware of their rights to complain about intrusive noise.